The first step to having a horse gain weight is to increase its access to forage. This provides several benefits in that it is good and natural for the horse’s digestive tract and can provide significantly more calories. There are a number of circumstances in which owners may want their horses to increase body condition. It may simply be because a horse has lost some weight over the winter months from less access to pasture, or because it is a very hard keeper. However, it may be because of something more serious, such as recovering from illness, parasitic infection, or from surgery. Then, too, a horse might be purchased or rescued without the desired amount of fat coverage around the ribs and body, or it may even be undernourished. 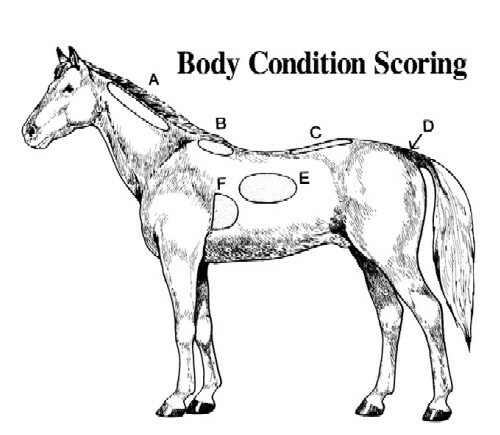 Horses should be in the body condition score range of 4–6, depending on various circumstances. Therefore, if a horse’s body score falls below these figures, feeding to increase fat storage and weight gain is warranted. Occasionally, an owner may have a mare that is having problems getting pregnant and may require some extra condition (though ideally still no higher than a 7). Horses in the 1–2 body condition score range are in a dangerous situation, largely because the associated lack of energy in such a condition has resulted from a lower overall nutritional intake, such as the lack of protein and vitamins. In these cases, nutritional intervention with the help of an equine nutritionist or veterinarian is strongly recommended. If you are unsure of the horse’s history, it is wise to start slowly, offering increasing amounts of feed over several days. Remember that forage is the most important component of an equine diet; therefore, good-quality, nutritious forage (higher-energy and -protein hay such as alfalfa) is ideal. Concentrates should be introduced slowly to allow the digestive tract (and more importantly the microbes in the large intestine) time to adapt. In some cases, these horses are in such poor shape they have problems eating and even standing. Intravenous fluids and nutrition may be recommended in this situation. Thankfully, most “skinny” horses we encounter are just those that could stand more calories included in their diet. It can’t be stressed enough that any changes to a horse’s diet should be made slowly, and this includes introducing more calories. There is very little data regarding how much energy (or how many calories) a horse needs to gain weight. 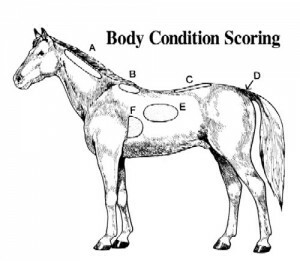 Furthermore, it is unknown if the same amount of calories a horse needs to move from a body condition score of 3 to a 4 are needed to move a horse from a 5 to a 6. That said, it has been estimated that one body condition score is associated with approximately 20 kg of body weight. It has also been estimated that it takes approximately 20 Mcal of digestible energy to gain 1 kg of body weight. Therefore, if a horse is expected to increase one body condition score, he needs to consume 400 Mcals more than he has been. If you think the average 500 kg horse needs only 16.7 Mcal/day, you realize that 400 Mcals won’t get into a horse all at once. Gaining (or losing) weight takes a long time, and owners will have to be patient before results can be observed. One way to determine how much to feed a horse is to take its current nutrient requirements (based on current body weight) or current feeding protocol and simply feed more calories. For example, if the increase by one body condition score described above were desired in 100 days, the horse could consume 4 Mcal (400 Mcal/100 days) more per day than it has been. If a more rapid weight gain is desired, feed should be increased accordingly. However, very rapid weight gain is likely not ideal, so be patient. If a specific timeline isn’t required, another simple way to have a horse gain weight is to determine its current nutrient requirements and increase its energy intake. For example, for a 450 kg horse the energy requirements would be 14.985 Mcal/day. To gain weight, the horse could be fed anywhere from 140% to 160% of his current energy requirements, or between 20.979 to 23.976 Mcal/day (which is more than would be required for a 500 kg horse). A horse that is naturally a “hard keeper” may need to be at the upper end of this range in order to gain weight. Alternatively, a horse could be fed to its desired weight, such that the 450 kg horse would be fed the requirements for a 500 kg horse (if that is its desired weight). In this example, the horse would only be fed about 115% of its current energy requirements and weight gain would be expected to be quite slow. If we take a look at some feeds available to help put these calories into the horse, we’ll recall that different feeds have different amounts of digestible energy per unit weight. For example, most types of hay will have approximately 1.7–2.2 Mcal per kilogram; cereal grains or commercially available concentrates will have a bit more than 3.2 Mcal/kg (depending on the type); and vegetable oil has about 9 Mcal/kg. What you feed can affect how quickly weight can be put on, but there are a few things to consider. For example, most horses won’t consume buckets and buckets of vegetable oil, not to mention the “shiny” stools that may appear if a horse consumes more than two cups per day (shiny stools aren’t necessarily a bad thing, but they do indicate that the oil isn’t being absorbed effectively). Also, if we think about overall feed consumption, the upper limit for many horses is around 3% of their body weight; they just won’t eat more than that! Another thing to keep in mind is the fact that feeding high amounts of concentrates (especially those high in starch and sugar) is associated with digestive problems such as colic or metabolic issues such as laminitis and insulin resistance. So, while concentrates may have more calories per unit weight than hay, they might not be the best choice to include in the diet at high enough levels to induce weight gain. The first step to having a horse gain weight is to increase its access to forage. This provides several benefits in that it is good and natural for the horse’s digestive tract and can provide significantly more calories. If the horse has eaten all the hay by the next feeding, consider offering one more flake (approximately 1.5 to 2 kg, depending on the hay) at each feeding. If possible, offering “free choice” hay is the best option. This allows the horse to satisfy its foraging behavior and allows it constantly to have something in the stomach and digestive tract. Some horses, however, won’t eat more hay if offered. In this case, an option is to offer something along the lines of hay cubes or roughage chunks. These products are essentially just hay, but in a different format, and they often “trick” horses into thinking they are getting some kind of concentrate. I’ve seen horses turn away any more hay but devour hay cubes. Just keep in mind that if you have an older horse, the hay cubes or roughage chunks may need to be soaked so the teeth can handle them (though an old guy would probably need his hay soaked as well). While hay cubes or roughage chunks are more dense and compact than hay, they are essentially similar from a nutrient content per unit weight (i.e., if you feed timothy cubes, they should be similar nutritionally to timothy hay based on weight). If additional forage (any form) doesn’t help put the pounds on, another option is to consider other fiber sources. Beet pulp (with no molasses to avoid sugar rushes) or rice bran is relatively high in calories (higher than forages) but is also high in fiber, so either is still a safe choice to include in your horse’s diet. Wheat bran is another alternative, but it has such an inverted calcium-to-phosphorus ratio (about 1:9 rather than 2:1) that it can be tricky to feed (you need to ensure other sources of calcium get the ratio back up to 2:1). Along with feeding various fiber sources, adding some oil to the diet is an easy and efficient way to add calories. Remember, fat has more than twice the (gross energy) calories as carbohydrates, so it is very energy dense. All oils are essentially equal in regard to their energy content; therefore if you are not looking for immune or inflammatory benefits, but simply to add some weight to your horse, the most inexpensive oil available at the grocery store will do. Recall that differences among oils depend on their chemical structure, the amount of double bonds between carbon units, and where these double bonds are placed. In addition to providing calories, the omega-3 fatty acids (such as found in fish or flaxseed oil) also have some immune function and hair coat benefits and likely some anti-inflammatory properties. One cup of oil (250 ml) has approximately 2.3 Mcal of energy and up to two cups can be easily fed to most horses. Some horses don’t like oil, and some are finicky about the different types of oil (canola vs. corn vs. cocosoya oils). Introduce oil slowly by adding it to something such as beet pulp to encourage your horse to eat it. Finally, if all else fails, offering true concentrates will provide more calories to the diet. Again, these preferably have more calories coming from fat and fiber than from starch and sugar. If you do choose to increase the amount of concentrates, it would be wise to consider introducing another meal feeding. For example, if you only feed twice a day, then each meal may be getting quite large (which may lead to digestive issues or wastage). Increasing the feedings to three or four (or more) feedings per day will allow the individual meal sizes to remain the same. If you have a horse in work that is on the thin side, the calories burned during a workout will counteract (at least some of) the calories in the diet. The calories required for maintenance (i.e., if you weren’t trying to get your horse to gain weight) would be higher to account for the extra work effort (described in Chapter 7). Therefore, feeding upward of 25–35 Mcal/day might be required for a 500 kg horse to provide the calories for work and weight gain (depending, of course, on the level of work and the horse itself). Some owners come across situations in which their horses simply won’t eat enough or are picky about their feeds (assuming the lack of interest in various feeds isn’t due to poor teeth quality or gastric ulcers, etc.). In these cases owners sometimes have to get creative. While sweet feed may cause problems with glucose and insulin dynamics, it is usually very palatable to all horses. The science and nutrition behind feeding may have to go to the wayside and owners may need to offer any feeds a horse will eat. For example, while sweet feed may cause problems with glucose and insulin dynamics, it is usually very palatable to all horses. Sweet feed and its associated sugar rushes, however, might make some horses “hot” and easily excitable, thereby actually expending energy and counteracting the extra calories in the diet. Some horses enjoy the taste of cocosoya oil or beet pulp, which are also options to increase caloric intake. Alfalfa hay may also be an option for some horses (if owners are careful about the excess protein) because it is extremely palatable. In many cases it is a bit of trial and error, though horse owners should remember to introduce new feeds slowly and not to expect results overnight. There are also some commercially available products marketed to improve weight gain. These are usually a mix of rice bran and vegetable oil and are often more expensive than buying the raw ingredients alone. They may be more palatable to some horses, though, and could be worth a try. Other high fat feeds that owners may find their horses enjoy include sunflower seeds and ground flaxseeds. However, there is little information regarding how much of these can be safely fed to horses. Regardless of the type of feed chosen, the overall diet should still provide the required nutrients for your horse. Ideally, the only thing that should be fed above maintenance requirements is energy, though this is difficult to do when increasing overall feed intake. For example, if you tried to increase caloric intake through offering an additional 5 kg of hay, you would also be increasing the horse’s protein intake and some vitamins and minerals (because these nutrients are also in hay). Horse owners should take a look at the whole diet to ensure all nutrients are being met and in appropriate amounts. There are some concerns regarding calorie-to-nutrient ratios, such that increasing energy without increasing other nutrients may cause problems; however, this is more important with growing horses than mature horses. This entry was posted on Tuesday, January 26th, 2016 at 10:37 am	and is filed under Horse, News & Updates. You can follow any responses to this entry through the RSS 2.0 feed. Both comments and pings are currently closed.